This was my best Beaver Island fly from 2014. It is very easy to tie, always rides hook-up because of the jig hook, looks great in the water and best of all the carp like to eat it. I tie this pattern in a couple colors and then use pink, red, purple and yellow as accent colors. 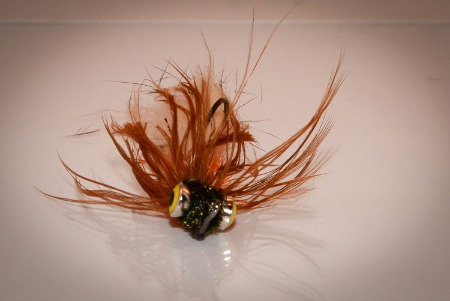 The tinsel and marabou are tied so I can remove then while on the water incase I need a bland natural fly. The fly fishes best in the 2-5 foot depth zone. Tying notes: I secure the eyes on top of the hook, then roll them to the underside and add cement. I think this makes a smoother, flatter bottomed fly (goby/schulpin like) and it hangs-up on rocks a little less than if they were left traditional. The 1/0 hook allows plenty of hook gap but with a smaller hook you might have a problem.